Displaying fine all-round performance, India ‘A’ inflicted a humiliating eight-wicket defeat on India Seniors in the final of the limited overs Challenger series to lift the Hero Honda N.K.P. Salve Trophy here tonight. Jonty Rhodes led South Africa to a four-wicket victory over Australia in a tense finish to their triangular series one-day international today. Upul Chandana and Thilan Samaraweera added a record 146 runs for the eighth wicket to put Sri Lanka in a strong position in the third and final Test against Zimbabwe here today. The English team is known to carry the tag of whingeing boys, cribbing about things before they start on a tour. 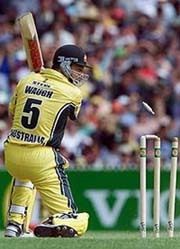 And its skipper Nasser Hussain did not try to get rid of that reputation when he criticised the lack of net-practice facilities at Kolkata. Riding high over local lad Karun Goel’s patient knock of 34 not out and a fluent 38 off 36 balls by Rahul Arora of Chandigarh, India scored an overwhelming victory over Bangladesh by seven wickets in the final of the first International School Boys (U-19) Cricket Tournament at the Punjab Agricultural University ground here today. Venus Williams takes a 20-match unbeaten run into the Australian Open hoping to swell it by another seven over the next fortnight. Jennifer Capriati may be the new women’s no.1 and defending champion heading into the year’s first Grand Slam tournament, but Venus is bidding to claim her third straight major here having won last year’s Wimbledon and US Open. American Venus Williams practises for the Australian Open in Melbourne on Sunday. She is the No 2 seed for the championships. Irina Brar has done it. Yes, this 18-year-old Chandigarh girl has entered her name in the record books of ladies amateur golf. She is the first lady golfer to make a clean sweep of all the six main regional titles thus emerging as the undisputed queen of the ladies golf circuit. India’s ace shooter Abhinav Bindra won his third successive silver medal at the Riac 2002 leg of the European Circuit Championship, which concluded in Luxembourg today. India ‘A’ outplayed the senior team in all departments of the game and cruised past the modest target of 155 in only 32 overs losing just two wickets. India ‘A’ bowlers had skittled out India Seniors for a paltry 154 in 35.5 overs with only Hemang Badani, later declared the best batsman of the tournament, contributing a substantial score. The Tamil Nadu left-hander, who had scores of 41 and 77 in the two league games, remained unbeaten on 52. India ‘A’, who maintained an all-win record in the tournament, did not have any difficulty in achieving the target thanks to a solid 75-run knock from opener Sangram Singh. The other opener Daniel Manohar contributed 25 runs while skipper VVS Laxman was unbeaten on 29. In a totally lop-sided final, India ‘A’ began their run chase on a strong note with Sangram and Manohar putting up 80 runs for the first wicket in 106 balls. The pair started attacking the senior bowling from the very start and scored at a fluent rate. Sangram, who reached his fifty off just 52 balls, finally fell to Harbhajan Singh with Tinu Yohannan coming up with a brilliant catch running backwards. His 75 came off 78 balls and included 11 fours and a six. FOW: 1-4, 2-6, 3-38, 4-62, 5-81, 6-82, 7-116, 8-142, 9-154. Bowling: Agarkar 8-0-30-2, Zaheer Khan 8-2-27-1, Sarandeep Singh 8-1-28-1, Manohar 7-0-30-1, Kartik 4.5-0-28-3. Bowling: Yohannan 8-1-31-0, Siddiqui 1-0-12-0, Bangar 4-0-22-0, Harbhajan Singh 9-1-30-2, Ganguly 2-0-19-0, Joshi 8-1-39-0. The national selectors today included wicketkeeper Ajay Ratra in the Indian team to play the first three matches of the one-day series against England while recalling Dinesh Mongia and Hemang Badani to the national squad. Ratra would replace Deep Dasgupta in the 14-member side announced by cricket board secretary Niranjan Shah. South Africa, chasing 199 to win before a crowd of 62,621, scored 199 for six from 48.3 overs despite some tight bowling from Australia leg-spinner Shane Warne (1-19), in reply to the home side’s 198 all out from 48.5 overs. One-day specialist Rhodes, who top-scored with 43 not out, shared a 65-run partnership with Neil McKenzie for the fourth wicket after South Africa looked vulnerable at 71 for three in the 17th over. FOW: 1-0, 2-39, 3-64, 4-106, 164-5, 164-6, 170-7, 171-8, 196-9. 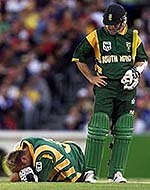 Bowling: Pollock 9-1-25-3, Donald 10-0-54-1, Kallis 9.5-1-30-3, Ntini 10-0-31-0, Klusener 7-0-33-1, Boje 3-0-19-0. FOW: 1-51,1 2-66, 3-71, 4-136, 5-169, 6-187. Bowling: Lee 9.3-1-42-2, Gillespie 10-3-28-2, Bichel 10-1-45-1, Warne 10-1-19-1, Symonds 7-0-41-0, Bevan 2-0-10-0. Chandana celebrated his return to Test cricket after more than a year with a career-best 92, while Samaraweera hit a patient 76 as Sri Lanka posted 418 despite Zimbabwe’s defensive bowling tactics. Fall of wickets: 1-50, 2-107, 3-125, 4-222, 5-229, 6-236, 7-254, 8-400, 9-413. Bowling: Streak 32-11-70-2, Friend 26-7-58-1, Olonga 18-6-52-0, G. Flower 39-7-89-2, Marillier 34.4.-5-101-4, Gripper 9-0-41-0. Bowling: Vaas 6-5-1-0, Buddika 3-0-7-0, Murali 6-3-3-0, Jayasuriya 2-1-5-0, Chandana 2-2-0-0. He admitted it was the first “whinge in over two months” but insisted at the same time that he did not see this complain as “whingeing”. He compared the facilities at Kolkata vis-a-vis “excellent facilities” in Mumbai and found the former wanting. “In fact everything on that tour was laid on immaculately for us by the Indian board, from the nets to the Test grounds, so this is the first whinge I’ve had for over two months — and I don’t really see it as whingeing because if the England captain doesn’t speak up, things won’t change,” Hussain wrote in the Sunday Telegraph. “We had our first net-practice yesterday — or rather we were scheduled to have our first practice at a Kolkata club ground. But the nets were so ordinary that we couldn’t use the quick bowlers’ net and all Andy Caddick could do was bowl in the middle to Duncan Fletcher (coach) with a baseball mitt, while Phil Neale went off to Eden Gardens to see if he could get us some nets there for today,” Hussain wrote in the Sunday Telegraph. “In the original schedule for this one-day series we were due to warm up in Mumbai, where we started the Test tour and found excellent facilities.” Within hours of arriving in Kolkata on Friday, the English team had demanded that they be allowed to practice at the Eden Gardens for the entire duration of their tune-up ahead of the inaugural January 19 tie of the six match one-day series but were politely refused by the Cricket Association of Bengal. The English demand came despite the mutually agreed schedule between the two boards which provided for two days of practice for the visitors at the Eden on January 15 and 18, while fixing the Football Club ground as the venue for the work-outs on the remaining days before the first tie. Hussain also expressed his unhappiness over squeezing in of the extra one-dayer for the cost of a practice match in the schedule. “Our original schedule also included two practice games in Mumbai. Now we have got one, against Bengal in the same club ground where we had to practise yesterday, and there is a big difference between one practice game and two. “Some of us haven’t played for three weeks, others haven’t played for three months, and we all need to practise with the white ball,” he wrote. Referring to Sunil Gavaskar’s description of England team as the “most boring team ever to play in India”, Hussain said “I don’t think that does the game justice”. Riding high over local lad Karun Goel’s patient knock of 34 not out and a fluent 38 off 36 balls by Rahul Arora of Chandigarh, India scored an overwhelming victory over Bangladesh by seven wickets in the final of the first International School Boys (U-19) Cricket Tournament at the Punjab Agricultural University ground here today. Contrary to the expectations, Bangladesh boys who lost their league encounter after waging a spirited battle against India were no match to the hosts as they were outplayed by the hosts in every department of the game today. Bangladesh began their essay on a cautious note with the openers scoring 31 runs in 12 overs before Tanvir Rashid, trying to accelerate the run rate was caught in the deep off Raj Kumar. Soon after, Naeem Islam left with score reading 38 for two. Bangladesh never recovered and they were restricted to a total of 136 runs for the loss of 9 wickets in the allotted 40 overs. Left-arm spinner Anant from Gujrat was the pick of the bowler capturing three wickets for 32 runs in 8 overs. Sunny of Haryana with an average of 144 runs was named the ‘best batsman’ and Karan Goel for his total 221 runs and three wickets in the tournament was declared the ‘player of the tournament’. Bangladesh’s Nadif Chowdhary for his haul of 11 wickets was adjudged the ‘best bowler’ and Rahul Arora for his outstanding fielding (7 catches) was declared the ‘best fielder’. Total: 136 for 9 in 40 overs. FOW: 1-31, 2-38, 3-53, 4-66, 5-93, 6-97, 7-115, 8-127, 9-133. Bowling: Sunny Behl 8-0-20-0, Raj Kumar 6-0-14-1, Sunny 3-0-12-0, Anant 8-0-32-3, Karan Goel 8-0-27-1, Paras Dogra 7-0-26-2. Bowling: Nazmul Hussain 5-1-17-0, Md Kafi Khan 4-1-23-1, Goutam Goswami 5.4-0-26-1, Nadif Chowdhary 5-0-16-1, Abul Bashar 8-1-26-1, Raquibur 2-2-19-0. Venus Williams takes a 20-match unbeaten run into the Australian Open hoping to swell it by another seven over the next fortnight. Jennifer Capriati may be the new women’s no.1 and defending champion heading into the year’s first Grand Slam tournament, but Venus is bidding to claim her third straight major here having won last year’s Wimbledon and US Open. Yet while 21-year-old Williams has swept the tennis world her form Down Under has not done her justice. She will be looking to redress the imbalance after her horror semi-final appearance to Martina Hingis here last year, when she won just two games in a 6-1 6-1 thrashing in just 53 minutes. That is the furthest Venus has reached in three Australian Open campaigns and to show her determination to break through this time she arrived before the New Year to prepare. She played in the Gold Coast WTA tournament and beat Belgium’s Justine Henin 7-5 6-2 in the final. 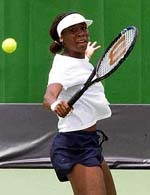 Venus bypassed the following Sydney tournament for private practice to tune up for the Australian Open. Like last year Venus will be in the same half of the draw as Hingis and her sister Serena, the 1999 US Open champion. Venus could play four-time winner Monica Seles in the quarters, while Serena and Hingis are on course to face each other in another quarter-final. Venus starts off tomorrow against American qualifier Ansley Cargill. Former world No.1 Hingis showed she is fully recovered from ankle surgery she underwent in October by outplaying American Meghann Shaughnessy in yesterday’s final of the Sydney International. It was her 39th title and ended an 11-month drought for the 21-year-old Swiss player, who is chasing her fourth Australian Open crown. She is seeking her first Grand Slam title since the 1999 Australian Open. 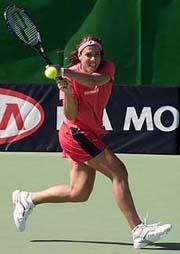 Venus and Capriati shared two Grand Slam titles each last season with Capriati adding the French to her breakthrough Australian triumph. Capriati enters the major as world No.1 having supplanted Lindsay Davenport, who is out for at least four months following a knee surgery last week. Irina Brar has done it. Yes, this 18-year-old Chandigarh girl has entered her name in the record books of ladies amateur golf. She is the first lady golfer to make a clean sweep of all the six main regional titles thus emerging as the undisputed queen of the ladies golf circuit. She won the sixth title, the West Bengal Ladies Open Amateur Golf Champpionship, at the Royal Calcutta Club on January 11. Back in Chandigarh, Irina shared her experiences with mediapersons at the Chandigarh Golf Club. By her side were her parents who have always encouraged this plus-two student of Vivek High School. Starting with the Punjab Open, Irina went on to win the Northern India, Western India, Eastern India, Southern India and the West Bengal Open titles. Her performance this year has been very steady. In fact she has played like the champion and is now all set to defend the All-India Ladies Amateur Golf Championship to be played in Mumbai from January 29. While winning the West Bengal Open crown, Irina had a four-round (in three days) aggregate of 305. This was four strokes better than the second placed Parneeta Garewal (another Chandigarh girl) who tied for the second spot with Anjali of Delhi. But because of a better back nine, Parneeta clinched the second spot. Playing on the longest golf course of the country, Irina played with the new driver, “thanks to dad”, to full advantage. Her recent stints with the coach, Jessie Grewal, also helped her in executing her swings with a perfect follow through. She set the ball rolling by returning a one-over card of 73 on the opening day. This card also turned out to be the best of the tournament. Two strokes behind her on the opening day was Anjali (75) followed by Parneeta (78). The second day saw all the three leaders returning identical cards of 74. Thus far Parneeta had the upper hand , maintaining her lead. But the next day turned out to be Bengal Bandh. The third day’s play had to be cancelled. The organisers decided to have the third and fourth rounds on the last day. This was the acid test . It called upon the golfer to maintain a calm approach and not to get ruffled in the nine hours of non-stop 36-hole competition. This is where Irina’s daily yoga exer ises with Mrs Sood came to the fore. Irina feels the yoga exercises helped her to bear the stress of the last day’s play. The 18-year-old sports apprentice with Indian Oil, returned cards of 76 and 77 despite twice being caught in the water hazard. These two double bogies could not stop the Chandigarh golf icon from clinching the title . The other Chandigarh girl, Parneeta Garewal, also gave a good account of herself to finish second because of a better back nine after she had tied with Anjali for the second spot. The defending champion, Vandana Aggarwal, was vanquished on her home ground finishing fifth in the tournament. And after the All-India event at Mumbai, it will be study time for Irina as her plus-two examinations are due from March 1 to April 4. “There are big intervals between different papers, that will give me just the right time to score well, said Irina, who has also been a topper in studies. Does she plan to become a pro. ”Not just now”, says Irina, who plans to go to the USA for a three month stint.” It is actually a wedding in the family, but I will stay on to meet some coaches. And with Jeev Milkha Singh there I should be able to get a good coach”, added Irina. So watch out, this Chandigarh girl might turn pro if all goes well abroad. Abhinav fired a series of 100, 100, 98, 99, 99 and 99. Trailing him was Von Kannel Phillipe of Switzerland also with a score of 595 and a series of 98, 100, 100, 100, 99, and 98. Abhinav had entered the finals at the top as his last series score was highest and more than that of the Swiss. The close battle was carried into the finals where Abhinav shot a final of 101.8 and in reply the Swiss shot 102.2, clinching the gold. Bronze winner Harmsen Mischa of the Netherlands trailed with a score of 590 and 102.9.